Tymon Mellor: The development of the Hong Kong road network has allowed the territory to expand and develop into the sophisticated city it now is. From the arrival of the British in Hong Kong in 1841, construction of new roads commenced almost immediately and continues to this day. The roads directly behind Queens Road, on the steep hillside were cut into the slope and houses constructed; by the time the area was surveyed by Lieutenant Collinson R.E. for his 1845 map, the basic arrangement that we see in the current streets was established. With the commencement of land sales in June, 1841 Victoria (Central) grew quickly. By October 1841 the total population of Hong Kong tripled in six months to 15,000 people with Victoria as the centre of the Colony. The print below from 1846 provides an impression of the growing settlement. A second road from Wong Nei Chong to Shau Kei Wan was constructed, including an extended causeway across the bay to the east of East Point, now known as Causeway Bay. 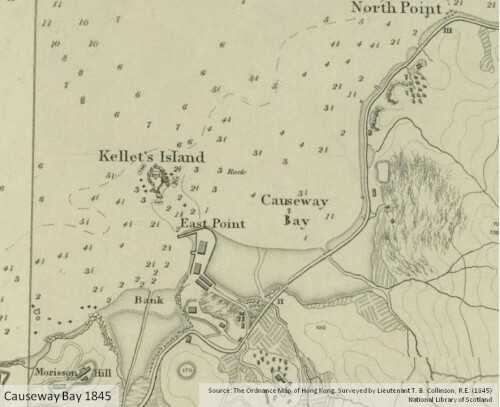 The bay, behind the causeway was later reclaimed in 1883 when a contract was let for $25,000 (1883 prices) for: “Constructing a stone Bank and a Nullah, and filling in the swamp at Causeway Bay”. 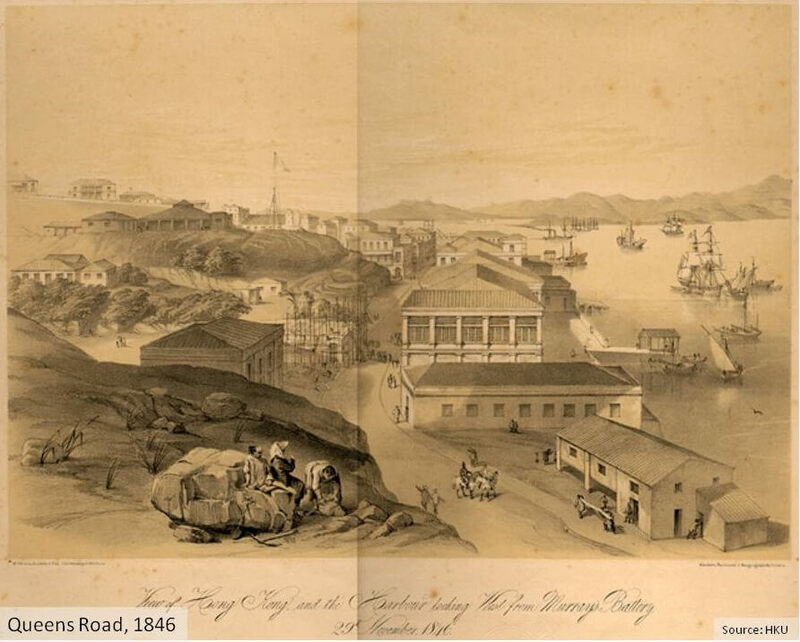 Road construction continued with the road between Shau Kei Wan and Sai Wan Ho, opening in 1845 and further extended on to Stanley. The following year the road from Victoria to Aberdeen was complete and this was extended to Stanley by 1848. 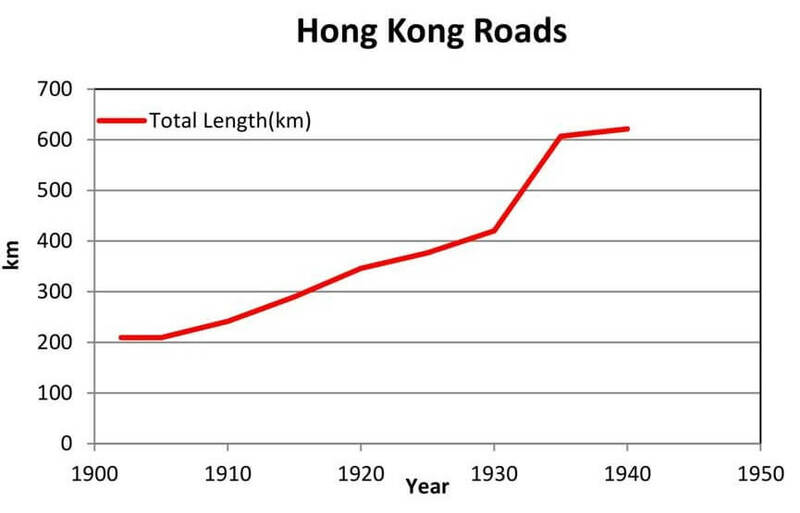 In the same year a road was completed between Victoria and Pok Fu Lam. 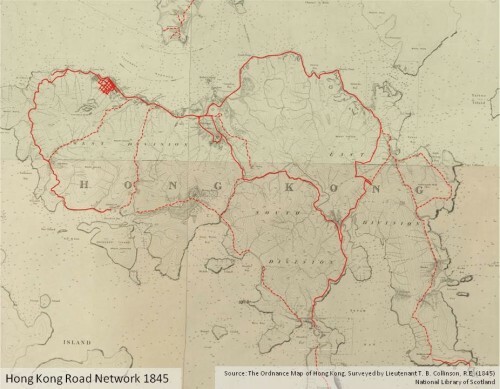 The extent of the completed road network is shown in solid red on the 1845 map below; and proposed or major paths in dotted red. 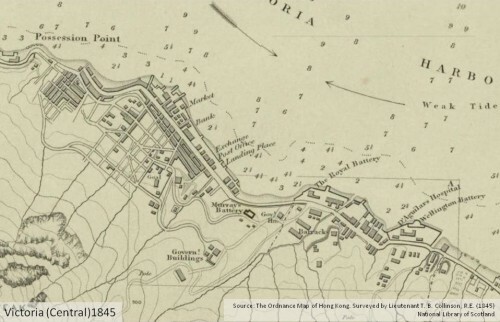 In this Notification (dated Hongkong Government House, March 22, 1842) Sir H. Pottinger announced his intention of appointing a Land Committee to investigate claims, to mark off boundaries, to fix the direction and breadth of the road, now for the first time called Queen’s Road, and other public roads, to order the removal of encroachments, and to assign new locations for dwellings of Europeans and Chinese. At the same time the announcement expressly notified the public that no purchases or renting of ground from natives, formerly or now in possession, would be recognized or confirmed unless the previous sanction of the constituted Authorities had been obtained, it being the basis of the footing on which the Island of Hongkong had been taken possession of and was to be held pending the “Queen’s royal and gracious commands, that the proprietary of the soil is vested in and appertains solely to the Crown”. The same principle was also applied to reclamations of the foreshore. But the fact that reference was made in a public document to an officially recognized and defined footing on which the Island had been taken possession of convinced everybody that the formal recognition of Hongkong as a British Colony had already been decided upon and was only delayed pending diplomatic and war-like dealings with the Peking Government. The roads were not what we would recognise today, many were no more than tracks; turning to mud with the summer rains. The early roads were constructed by clearing the land and where necessary, building stone retaining walls followed by the construction of the metalled surface using 4 inches (100mm) of cement or lime concrete or stone or decomposed granite. Drainage was an optional extra! To try and improve the performance of the roads, a new material was tested in 1898 on Queens Road. The road was surfaced with “the hard blue crystalline gneiss of which there is abundance in the Colony instead of with friable white granite”. The material is probably what would be described today as Coarse Ash Crystal Tuff. The initial trial was problematic as the stone could not be consolidated using a “stone roller drawn by coolies” and the cost of hand breaking the stone was double that of the soft granite. The problems were solved with the procurement of a steam roller and rock crusher from England. There were some fundamental problems with the roads, as recorded in the Commission of enquiry into the Public Works Department in 1902. They were in poor condition, “There are no foundations to any of the roads. They were cut out of the hill in the early days, and macadam (mixture of soil and stone) was laid on the top without any foundation, and the consequence is that so soon as we put macadam on now it wears into holes on account of having nothing to support it underneath. Then again we have to use very soft stone. This granite we are using is what is known as telepathic granite, and in rainy weather it breaks up and forms into mud, and in dry weather becomes dust.” When asked why a foundation was not provided, the response was; “It would be an enormous expense”. 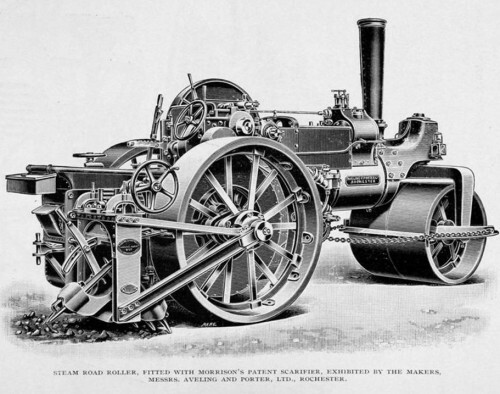 In 1905 a trial was undertaken to test different types of paving. At the junction between Des Voeux Road and Pedder Street wooden blocks were laid, on a short section of Queens Road West slabs of granite were placed and in 1906, granite sets 6” by 6” by 3” were installed. The results of the trials are not given in the records but concrete and granite macadam continued to be the normal until tar macadam was introduced in 1908. By 1915 with the opening of a Government Quarry, it was possible to get all the necessary grades of stone to produce a quality asphalt, this would replace granite setts, macadam and concrete to become the standard road surfacing material for the territory. Road construction continued; by the turn of the century Lugard and Harlech Roads were constructed encircling the Peak, much to the displeasure of the local inhabitants, they thought it “likened the effect of putting a halter around the neck of the Hill of Great Peace”. The diamond jubilee of Queen Victoria in 1897, was marked by a proposal to build a road around the Island; the scheme was opposed by the military but, after lengthy delays, the section below Mount Davis along the 45m contour (Victoria Road) was commenced. The advent of the motor car stimulated upgrading the existing carriage roads and by the end of 1915 Pok Fu Lam, Aberdeen and Deep Water Bay were all accessible by car, to be followed by Repulse Bay in 1917, Shek O in 1923 and finally, in 1924, direct vehicle access to the Peak itself After this date road construction on the Island was usually limited to road improvement, for instance to Kellett Road in 1928 and in the following year to Barker Road. In Kowloon, by 1887 a fairly comprehensive road system was in place south of Austin Road. 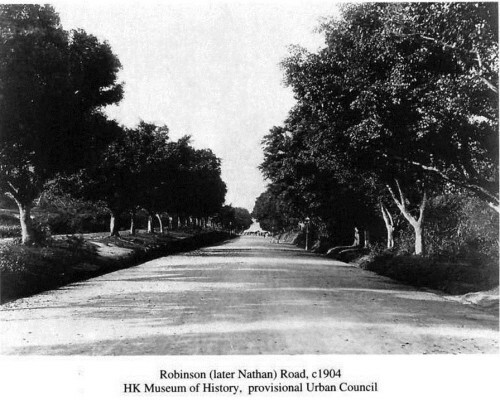 The first 850 metres of the 30 metre-wide Robinson (Nathan) Road from Middle Road, some 1.1 kilometres of MacDonnell Road (later Canton Road), and Des Voeux Road (later Chatham Road) were all started. Many of the intersecting roads, for example Granville and Kimberley Roads, were already built. To the north of Austin Road the road network was concentrated in the southern Yau MaTei district with the 15 metre-wide and 1.6km-long Station Road (later Shanghai Street) reaching Mong Kok Tsui. A small independent road system had already been constructed in the Hung Hom area near the docks, for example Bulkeley Street and Gillies Avenue. By the turn of the century there were some 35 kilometres of roads in Kowloon which included the first two original direct links into the newly-leased New Territories, that is those to Kowloon City and the Tong Mi area. In particular the road network in the new development at Yau Ma Tei was well under way and the Hung Hom road system had been enlarged and connected to the extension of Des Voeux (Chatham) Road. 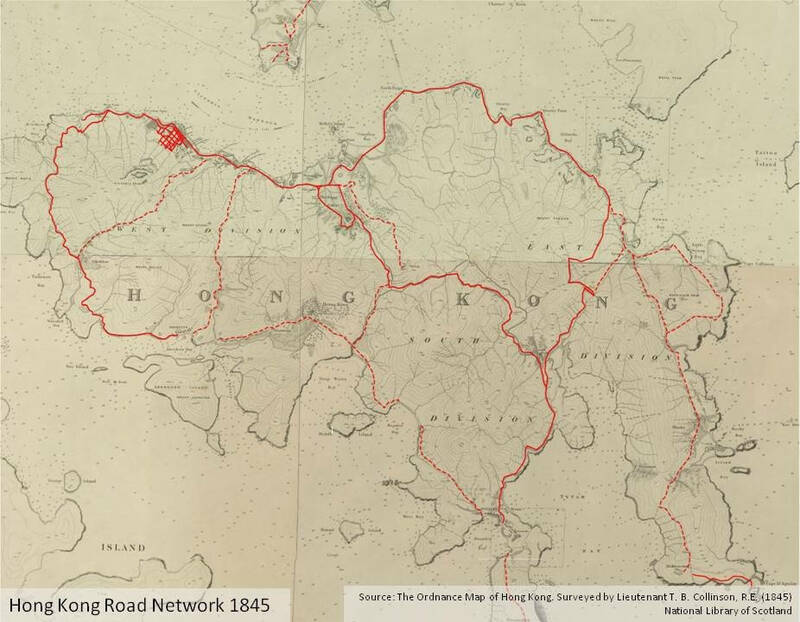 The main road network in Kowloon continued to expand with Sham Shui Po being linked to then existing road system in 1916 with a 6 metre wide 700 metre long road, part of which was formed on a 3.4 metre high embankment. The first section of Waterloo Road, Argyle Street and much of Prince Edward Road were completed by 1924. At this time, Nathan Road had been already extended by Coronation Road (later also part of Nathan Road) nearly up to the old boundary. By the outbreak of the Pacific war in 1941, part of Kowloon Tong, then a garden city, was developed to the west of Waterloo Road together with an adjoining section of Boundary Street and extensive additions were made to the subsidiary road networks, in particular in the Mong Kok, Sham Shui Po and To Kwa Wan districts. With the leasing of the New Territories a detailed plan was prepared for the construction of roads within the quiet rural area. In the 1898 Report by Mr Stewart Lockhart on the Extension of the Colony of Hongkong, Appendix 4 established the roads to be constructed. They included; “a good cart road” to Tai Po, 26 miles (42km) and on north to Sham Chun (Shenzhen), a road from Sham Chun to Shau Tau Kok, 10 miles (16km) and a road linking Hung Hom with Kowloon City and on to Sai Kung. Bridle roads were proposed to connect the other major villages, but the lack of mapping for the New Territories complicated the planning. The first section of the New Territories ring road, that from Kowloon to the administrative centre Tai Po, also known as the Frontier Road comprised a 4.3 metre wide carriageway following the zig-zag course of the old footpath and was completed in 1902. This was subsequently upgrade to improve the alignment in subsequent years. Au Tau creek was bridged in 1916 with an 11-span 95m-long reinforced concrete structure supported on hollow 340mm concrete box piles, where previously a local punt service was available, to join the 6m-wide stretches of road from Fan Ling and Castle Peak (Tuen Mun). Two years later the coastal road from Sham Shui Po to Castle Peak was started which at the time was aptly considered to be Hong Kong’s La Corniche and, in 1920, the whole of the 90km-long New Territories ring road was finally completed. 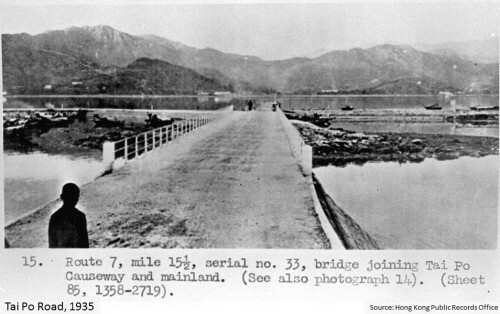 About 1927, the Tai Po road bridge adjacent to the railway was reconstructed with a 7-span reinforced concrete structure. Improvements were carried out to the Fan Ling/Sha Tau Kok road in 1929, much of which had only been in service for two years, generally making use of the disused railway formation. Subsequently a new road was built from Au Tau to Shek Kong village in 1936, thus providing access to the proposed second airfield site at Pat Heung. In the following year the first roadworks on the outlying islands were undertaken at Muk Wo (Mui Wo) on Lantau, primarily to provide access to the ferry pier. The development of Hong Kong roads has tried to keep up with the economic development of the territory. The length of road tripled between 1900 and 1940, linking the urban and rural areas and changing the social landscape of the areas impacted. This was nothing compared to the social and economic changes ahead, and the extension of the road network to 2,099 kilometres (2014). This article was first posted on 1st May 2015.